If you’re like one of the millions of people who visit Washington, DC every year to see the history, take in the sites. And witness where the political powers reside for the United States, you will be surrounded by many VIPs. You might not see them, but they’re all over the city. You deserve to be one of those VIPs and you can get that kind of treatment when you hire Nationwide Chauffeured Services for our Washington DC night tours. What is a Washington DC Bus Tour? Perhaps you’ve heard about this type of tour in the past, but if you’ve never been on one it may be a bit foreign to you. Essentially, taking a night tour means you’re going to ride around on a comfortable, luxurious bus during the nighttime hours, when the lights illuminate most of the main attractions. Many people extoll the virtues of enjoying some cities at night because of the beauty that exists when everything is lit up. If you’ve ever heard about the ‘Manhattan skyline’ at night, then you already know that it’s different than daytime. The same is true for Washington, DC and night tours in DC are the best way to get around and see what this incredible city has to offer. What you can see in DC Sightseeing Bus Tours. 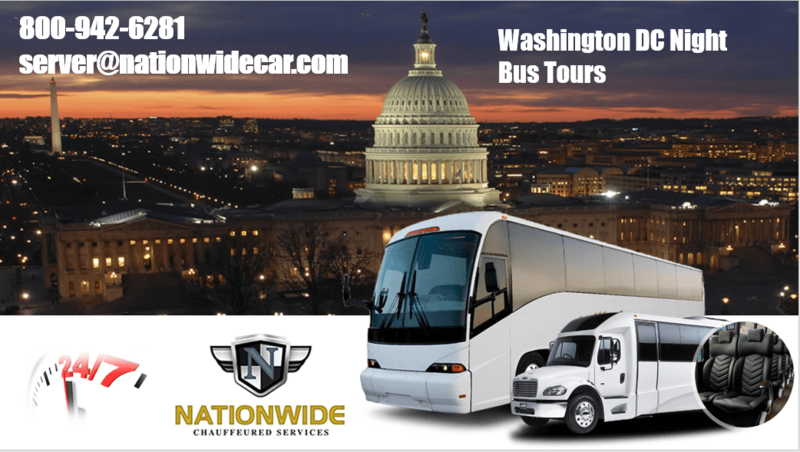 When you take a Washington DC night tour with Nationwide Chauffeured Services, you’ll get the opportunity to see some of the most coveted attractions. Including the National Mall, reflecting pool, the Air and Space Museum, the Watergate Building, the Capitol Building, the White House, and much more. Some of these sites will be viewed through the windows of the tour bus DC while others will provide you. And opportunity to step out and walk around, stretch your legs, take pictures with your family or friends, and get up close and personal with them. There’s only so much that you can truly enjoy when you see many of these attractions in pictures, either in a book, from friends who visited here, or even on your computer. When you’re here in person you’ll be in awe of the incredibly architecture, design, and lighting. Get the best DC Tours with the most knowledgeable and friendly guides. Depending on which Bus Tour of Washington DC you choose, you could have a separate guide who will highlight all of the main sites you’ll see beyond your windows. Our DC Sightseeing Tours and DC Tours drivers and guides are very knowledgeable and courteous. And will be able to answer your questions, no matter what they are, as long as they’re related to the Bus Tours Washington DC. Or Night Tours in Washington attractions themselves. There is an incredible amount of history throughout the city that goes unnoticed until you take one of these tours. Did you know why the Capitol building is designed the way it is? Do you understand the reason for two chambers of Congress that have offices there? if you you are planning for a Washington DC Monuments Tour. What about the Lincoln Memorial or the Washington Monument? Do you know the special, unique stories behind their development, design, and construction? A major earthquake struck the East Coast in 2010 and caused a major crack in the Washington Monument. It has only recently reopened to visitors and is now slightly shorter than it was before the damage. With Nationwide Chauffeured Services, you will learn a great deal about many of the top attractions. Why choose Washington DC night tours? You can see many of these same attractions during the day, but you won’t get the same awe inspiring views. And breathtaking vistas as you will at night, under the lights and twinkling stars. Another benefit to choosing a night tour when you’re here has to do with a relaxed pace and atmosphere. During the day these attractions can become incredibly crowded. Having to make your way through and around thousands of other people visiting the city at the same time can be frustrating for some, but you won’t have to worry about that when you’re on a night tour. Now, about that VIP treatment of DC Tours. If you’re interested in being treated like a VIP, step aboard any of the Nationwide Chauffeured Services buses. You will find comfort and plenty of room to stretch your legs. You’ll be treated with the utmost respect the moment your step aboard and you’ll get the chance to spend a non-rushed evening or night going throughout this incredible city. A VIP is a very important person and when you rely on Nationwide Chauffeured Services that’s exactly what you are. If you wish to spend a few extra minutes at one destination or another, that’s not a problem. If you have questions, concerns, or any specific needs to help make your trip more comfortable, all you need to do is voice them to our Washington DC Tours driver, guide, or other staff members. We, Washington DC Bus Tours are dedicated to ensuring that everyone has a memorial visit to the Nation’s Capital. Nationwide Chauffeured Services Washington DC night tours are some of the best you’ll find anywhere. Whether you’re traveling with family, friends … have a large or small group … or are simply looking for something different to do during the evening hours, Nationwide Chauffeured Services can accommodate you.